Written on Mar 27, 2019 . Posted in Commercial solar solutions, Residential solar solutions. A solar energy system is a long-term investment and this information has been formulated by Specialized Solar Systems to help assist you with your solar energy system choice and upkeep. Solar energy generation systems enable your home or establishment to generate electrical power from the sun and are engineered by Specialized Solar Systems to provide many years of automatic operation without producing air emissions, noise pollution or requiring fuel or extensive mechanical maintenance. Solar energy uses sunlight to generate clean renewable energy. Power produced by a solar energy system displaces the need for conventional energy generation. It is estimated that every kW of installed photovoltiac or PV generation prevents 6350kg of CO2 (associated with global warming) and 13kg of NOX (a source of smog) during its lifetime. Every kWh generated by your system means less energy needed from the national grid, which means lower electricity bills. The installation of a solar energy system affords one partial to complete autonomy from the services provided by Eskom. Traditional and grid electricity supply is slowly being changed with the use of alternative power providers, specifically in the field of renewable energy. When choosing a solar system, one should understand the three main configurations of systems available, to safeguard that the system you need will supply energy when and where it is required. The three main system configurations available can be summarized as follows. This system design will supply PV generated solar energy directly into your load or energy usage. If more power is required than what the solar modules can produce, this additional power requirement is drawn from the utility grid. At night or during periods of low sunlight when the solar modules do not produce enough power will result in the required power draw being supplied from utility grid power. This system requires grid power to ensure it completes its function at all times. In the event of grid failure, the system will stop providing energy. Grid-tied solar system configuration is the most economical and ideally suited to reduce or supplement one’s load. This load is reduced during the day in the form of a bell curve, as the sun rises in the morning and sets at night. The Hybrid system combines the Grid-Tie and the Off-Grid systems. This system does not require the grid to stay operational. One can program the Hybrid system to function as a Grid-Tie system, supplying the full bell curve curing the day, whilst charging a smaller battery storage bank for support in the event of grid failure at night. This system design takes into consideration the energy consumed during a 24-hour period. Within the design specification, battery storage is utilized to supply power at night, while the sun generates energy for the load during the day. Each of the above systems have many programmable functions and each program should be tailored to each individual customer’s needs, ensuring the best effect of this system is achieved. Each system can also have remote functionality. When supplying an energy system to your premises there could be feedback from your system to the municipal grid. Certain legislation needs to be adhered to. In this case there is no grid (i.e. not applicable to your system). Your energy system consists of various components. Most of these components are there to ensure that the energy produced by the solar panels is utilized within the designed framework. Solar modules are either roof-mounted or ground-mounted. During daylight hours, the solar modules instantly convert sunlight into DC (direct current) electrical energy. Modules are connected in series, delivering enough DC voltage to operate the inverter. The number of modules will depend on the size of your system and, collectively, they are known as the solar array. This solar array will generate energy for 25 years at 80% of the initial capacity. The DC current (amps) output of a solar module is directly proportional to sunlight intensity. Output varies with sun angle, shadows and shading – all of which can greatly impact electricity output. It is most efficient to have solar panels facing North (in the Southern hemisphere) at the optimal angle for the area. The lower the angle, the more efficient in Summer, the higher the angle the better in Winter. These limits will be determined based on the area of installation. (Please refer to your installer to ensure this has been done correctly.) 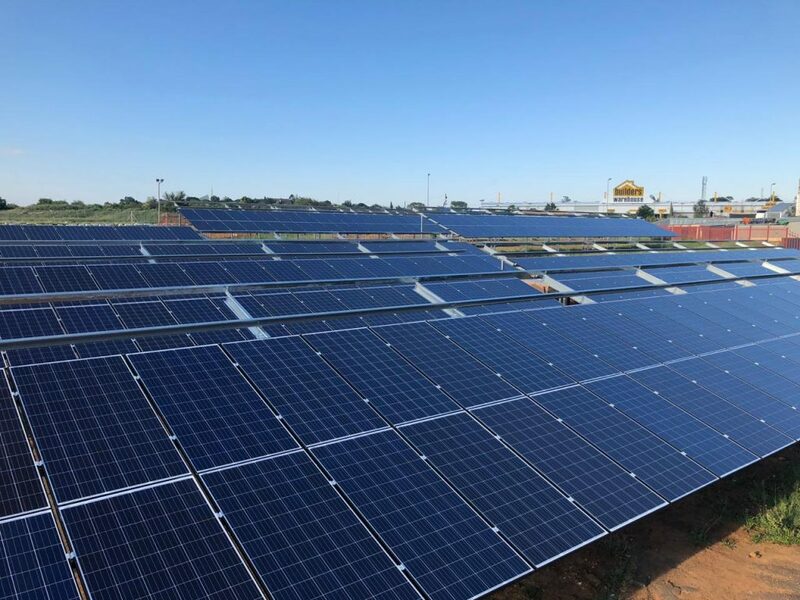 Since the production of energy is what you are paying for, one needs to ensure that the maximum yearly kWh is produced by inclining the panels correctly. Please ensure that you understand the expected kWh production and how to monitor this. The installer will assist you in explaining this. In South Africa the production of kWh varies between 3.5 and 6.2 kWh per 1000Wp installed. This variation is caused due to Summer|Winter weather conditions, and the area of installation.